Investors returned to the hedge fund industry with net positive flows to start the second half of the year. So, all is well, right? Unfortunately, no. A well-below average proportion of funds have received inflows for a second consecutive month, and the most favored strategy of the first half of the year, macro, produced asset-weighted losses in-line with above average losses seen in February, which sets up a testy second half of 2018. There are positives, however. Investors returned to equity strategies, with a heavy preference for market neutral, quantitative and sector-focused approaches. Commodity strategies are quietly getting new allocations, and even within emerging markets, where returns are falling precipitously with every rate hike and tariff tweet, certain managers are receiving new allocations as apparent awards for producing positive returns while their markets fall. Hedge fund flows returned to positive in July as investors added an estimated $5.85 billion. Macro funds faced elevated redemption in July, and recent returns set up a difficult second half of the year. Managed futures flows were negative for a fifth consecutive month, though the pace slowed significantly. Emerging market fund redemptions continue, but allocations are available to those who can outperform. 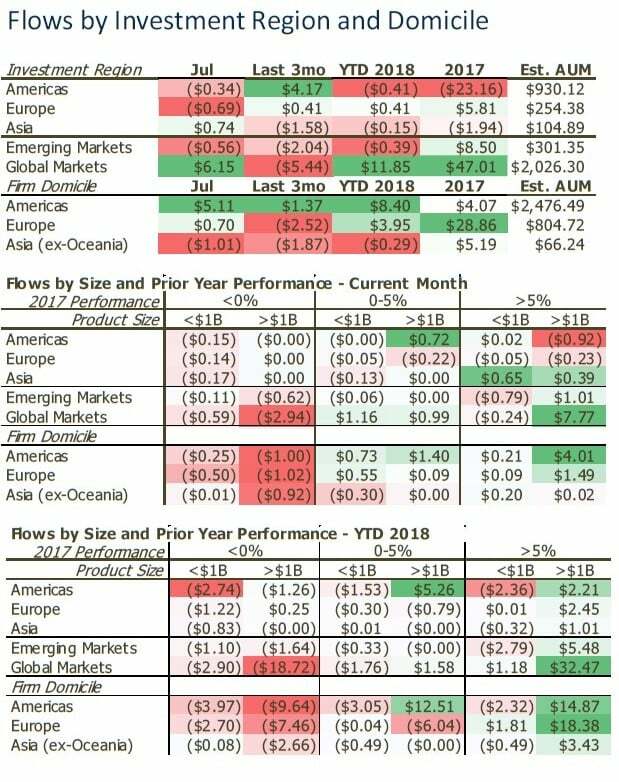 Investors added an estimated $5.85 billion into hedge funds in July bringing YTD net flows for the industry to $11.63 billon. Total estimated hedge fund assets are now $3.307 trillion. Money appears to be swirling around the largest managers. For the second consecutive month, there was an elevated proportion of large funds which saw meaningful allocations, and large funds which saw meaningful redemptions. >$1B AUM funds which received new allocations that accounted for greater than 2%, or even 5%, of their beginning year AUM were 18.5% and 8.3%, respectively. Evidence of AUM consolidation continues. Looking across all reporting funds, only 42% had net inflows in July while 58% had net outflows. When a lower proportion consistently gathers assets while a larger proportion loses assets, money is being consolidated within fewer products. July was the second consecutive month when proportions were very low. The prior 30-month average was 49% with inflows and 51% with outflows. Macro funds faced the second month of elevated redemption pressure this year. July was the third month after macro funds’ aggregate string of performance losses ended, so it shouldn’t be surprising to see net outflow from the group now. With losses in July near the level of losses seen in February, it will be a tenuous second half of 2018 for macro managers. Macro fund redemptions and new allocations hitting familiar targets. Most of the macro funds with redemptions in July are products which had seen cumulative net redemptions for the year so far. On the other side, products with the largest ten inflows in July all had positive net flows in the first half of 2018. Managed futures redemption pressures go into a fifth month, but the pace has slowed. The managed futures universe has seen over $10 billion in money removed over the last five months. That’s a significant amount, but the good news is that in July net flows were negative, but nearly flat. Some larger funds continued to face outflows, while new inflows tended to go into smaller (but not necessarily unknown managers’) funds. The string of redemptions from long/short equity stopped in July. Quantitative strategies and sector-focused funds (healthcare & energy) were the demand drivers for long/short equity in July, stopping a string of redemptions which had accelerated into H1’s end. There was a spike of interest in commodity exposure to start H2 2018. Commodity funds have steadily been gaining new assets in 2018. 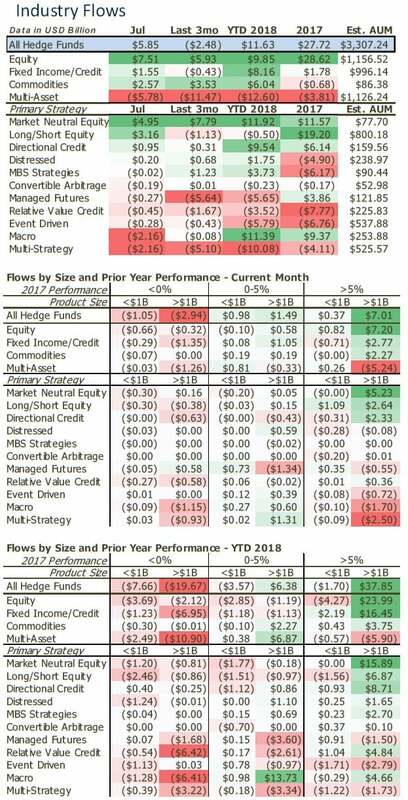 They’re one of few strategies which have had net inflows in each month of the year (market neutral equity the notable other) despite mixed returns. A strong US dollar and global trade policy has hurt EM returns and investors’ sentiment. Three-quarters of EM managers faced outflows in July. Average 2018 returns from those losing assets in July was nearly -6%. The strong US dollar appears to be driving investors away from fixed income strategies, as four of the five largest redemptions in July were from those targeting fixed income opportunities. Good performance in difficult EM markets is still being rewarded. The main reason net flows were not more negative in July was because a small group of products have been significantly outperforming the rest of their EM peers. The positive takeaway here is that it’s not EM markets necessarily that are pushing investors away, it’s EM funds that are unable to perform contrary to the directionality of the markets in which they invest. A mixed bag for Europe-domiciled funds resulted in flat July flows. Don’t let the near flat redemption levels mislead you from the fact there were some elevated allocations and redemptions from within Europe-domiciled hedge funds in July. Equity-focused managers, mostly with global investment mandates, received the largest new inflows in July, while redemptions were targeted toward specific multi-strategy products.